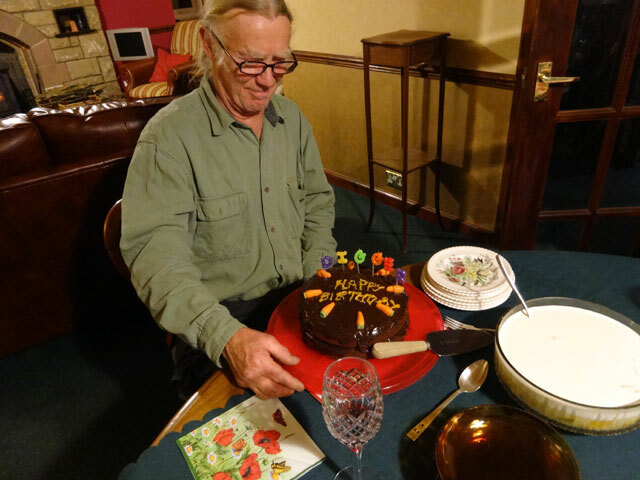 Digger admires his birthday cake – the candles have been blown out, we have sung Happy Birthday and now the lights are back on. Close inspection shows that the chocolate cake has been decorated with chocolate carrots: how appropriate! Up, and after walking Mix, I breakfasted with Andrew who, in mid morning, set off for Hull and his ferry to take him on the next stage of his journey home to France. By that time Tom with very little help from me had completed the uprights for the second internal wall in the bothy and even made a start on the wall-cladding. We shall complete this wall tomorrow (and maybe make a start on the next one). No sooner had Andrew left than Richard, one of my great friends from studying at Princeton days, arrived. I had a grand day with Richard, catching up on all that each of us is doing, having a snack lunch at Pearsons, showing him around our activities and visiting the churches in Gavinton, Fogo and Ladykirk. Before Richard left we had afternoon coffee with Mum in her garden room. By the time that Richard left, Cathy had arrived and was having tea with Rachel in the Granary. I came across to the summer house to try to get my blog up to date but, just before dinner, a wood delivery arrived from the St. Bathan’s Sawmill, kindly brought down by Willie on his way to his band practice. Rachel and I got the wood into the bothy (we should now have enough to complete the job) and then we joined everyone – everyone extended to include Scott and Sue – for a dinner in aid of Digger’s birthday. It was an extremely happy meal with a great cake made for the occasion by Sue and afterwards all of us (except Scott and Sue) made their way across to the Granary to watch Grantchester (held on pause until everyone was ready: isn’t technology great)? After the news, I walked Mix and retired to bed contemplating how fortunate I am to have friends like Andrew and Richard. Life is good.